1, 2, 3, 4 I declare a …..
Each campus (North & South) has their own jugs for collecting money. 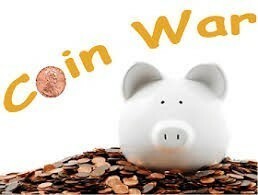 You gain points by collecting coins or dollars in your coin wars jug. The campus with the MOST money at the end of the war wins!! The winning campus will get to SLIME their principal! Who doesn’t love slime!? Get your coins ready and show us how bad you want to SLIME YOUR PRINCIPAL! !